The 3 cards you see above are card BACKS to three different tarot decks. Concentrate on a question you have. It may be something you are considering today. Maybe you are wondering about whether or not to do something, or a relationship concerns you. Consider what is itching you today. Look at the 3 cards. 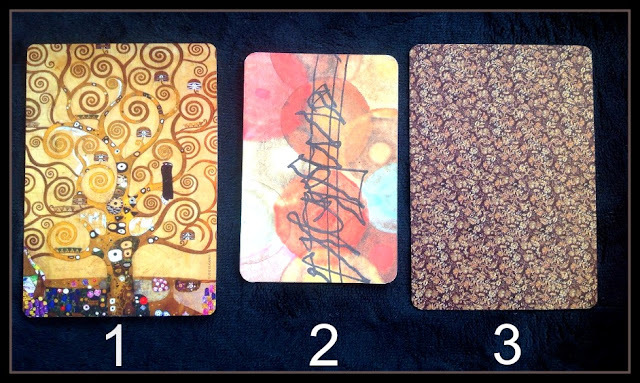 They have been randomly drawn for you from each of 3 decks. Consider which one you are pulled to. You may want to hover your hand over each one to see which one pulls you. Be true to yourself. You may be pulled in many directions by opinions, but you have an inner gut reaction to what is right for you, despite others’ suggestions. When you follow what your soul already knows to be true, the answer is always right for you. It’s time to live your life, not let others pull you by a tether. There is a fairness in your decision, a consequence of an action that has brought you to this point. You can act on it or wait based on your gut guidance, but whatever you choose, you are aware. The crux of the matter here is choosing between what/who is right and what is wrong. The criticism within has created a conflict in the mind. When there are rigid ideas of “good” and “bad,” we fail to see that to every rule there is an exception. Release yourself today from the formal rules you’ve been taught and instead take a good, close look within. How does this sit with you? Is it something you were told should or shouldn’t be, or do you already know it to be so? When you’re confused, try to break through conditioning, see the situation as unique from others, and then see where your mind shows you the balance lies. Does something need to be corrected to continue? Can it be corrected? Has correction already been tried, and what were the results? What is the action of the highest good? The higher instinct within you has a compass that will point you toward the answer to your dilemma. Morality here will guide your direction. This is something that may take several steps and lots of repetitious work. It will take action and dedication on your part, but with repeated practice, this can come to be. It will, however, take time and it won’t likely happen without crisp application on your part. What needs to be done to break out of this inertia and get the job done? What might need reminding or repetition over and over until the desired outcome can be achieved? This card asks you to stop thinking and put your nose to the grindstone and do all the necessary physical steps to make it happen. It will take action to manifest this important investment in a physical way.Notice patterns that happen when you reach toward this goal, and use what you learn from those to correct your direction to the best outcome.